The samba, the beaches, the parties¦Brazil is one of the most funnest places to visit on this planet. Imagine the time you will have aboard a 4-night Costa cruise! The Costa Victoria is your vessel on a journey that begins and ends in Santos, a city in Sao Paulo. In addition to being the entry point for the bubonic plague in Brazil in 1899 (no sign of it today! ), Santos has the biggest seaport in Latin America, a Coffee Museum that will leave you buzzing and a soccer memorial dedicated to city’s greatest player, Pele. From Santos the ship heads to Rio De Janeiro, a city that needs no further description. Rio is place that everyone should experience at least once in a lifetime. 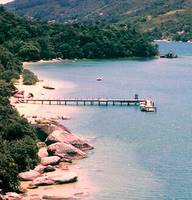 From there it is on to Ilha Bela, a lovely island archipelago that is a popular holiday vacation spot for Brazilians. The final port of call is Porto Belo where the beach is stunning and the warm waters perfect for fishing, snorkeling and surfing. If you aren’t relaxed after this voyage you are destined to a lifetime of stress. You can check out the best deals on airfare to Brazil to go along with this quick, but eventful little cruise.